Summary: Once a Chadi sector GEN girl terrified of her first Assignment, Kayla is now a member of the Kinship, a secret organization of GENs, lowborns, and trueborns. Kayla travels on Kinship business, collecting information to further the cause of GEN freedom. With the virus and the bombings decimating the GEN community, freedom and love are put on the back burner as Kayla and her friends find a way to stop the killing . . . before it’s too late. Image from Amazon and summary from IndieBound. Review: Last week in her review of Fragments, Audrey wrote, “Second books in a trilogy are always complicated.” I couldn’t agree more. Middle books often seem to wander a bit merely waiting for the final wrap up in the third. In this case, the first book, Tankborn, left quite a few strings untied and much open for speculation, but this second book raised even more questions and provided very few answers. A completely new storyline is introduced and only a smattering of clues come with it. Karen Sandler certainly leaves the reader begging for more, since the book ends rather abruptly in the middle of some major action. The author has created characters that the reader can care about, so it can be a bit frustrating for the reader when faced with a cliff-hanger. You may want to wait until the third book is a bit closer to release so you can read them close together. Revolution is slated to be released in the spring of 2014 and that seems like a long time to wait to find out what will happen next. The benefit of a trilogy though, is that the world is already created, the characters are in place and a lot more development can happen. 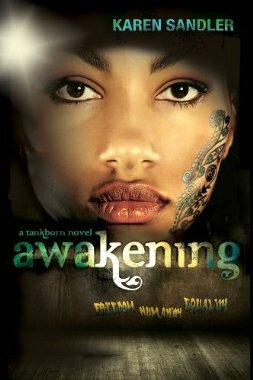 In Tankborn, Kayla’s physical and emotional strength were demonstrated on many occasions and the reader could get to know her to a certain degree. In Awakening, Sandler takes that next step and shines more of a light on her inner strength. Kayla has many choices to make and Sandler really takes the opportunity to flesh out who Kayla is and what she truly values. This book also delves deeper into the caste system and the effects it has on the entire society. The ranking of GENs, lowborns, and trueborns is extremely rigid and even the privileged people who are “helping” still don’t always see how little respect they show those who are lower in the order. As the truth is exposed, characters come face to face with the ugliness in their society and must make the choice to let it remain or take steps to make a change. Fortunately, there is hope for a better future. One of the cool things about this book is the wildlife on the planet Loka. I found the “pet” seycat to be pretty awesome. Kayla noted that, “Seycats like Nishi might be barely knee-high to the tall GEN boys, but they could slash even a full grown man to ribbons with those claws and teeth” (16). They generally eat rat-snakes (venomous spider creature with a rat-like head and long snake-like body) and sewer toads. Nice. Once in a while it felt a bit like the vocabulary was forced in and a bit deliberate so the world would seem radically different than Earth, but for the most part it worked. Karen Sandler has a vivid imagination and she uses it to spin a tale complete with deadly meter-high spiders called bhimkays and Genetically Engineered Non-humans who often times appeared more humane than their human “superiors”. Recommendation: If you cannot take suspense, I would say wait until the final book, Revolution, is closer to release. Otherwise, get it soon along with Tankborn if you haven’t already read it. You would miss a lot — particularly the backstory of Kayla’s relationship with Devak without reading that first. Both books are thought-provoking and entertaining with plenty of action, mystery, and a bit of romance.